Could this be the remnants of an overnight bee beard? It was super-duper hot the previous day (90F), still 82F when the bees retired, so maybe they had bearded? But it got down to 63F by madrugada – do bees un-beard in the dark? Or were they doing something entirely novel to me? I looked closely at this line (it was a bigger pendulum when I first saw it), and it did not appear to contain anything but worker bees, so they weren’t kicking out drones, saving their queen, or removing an intruder (all hypothesis I considered). But we are done with broody hens. Having them raise baby chickens is beyond adorable, but we need a break. Although the interwebs provided no useful information on breaking broody hens when I looked in 2012 (shoo her off the nest, dunk her in cold water), this time around I have found a potentially useful approach. It goes like this: To break your broody, remove her from the nest, stick her in a cage with food and water but no nesting options. So I have ironically renovated the Broody Box into a Broody Breaker. The nesting platform is fenced off so she cannot use it. The box has been raised and the open floor underlain with wire mesh. The idea is that it’s not very comfy, but she won’t be walking or sitting in poop. That’s it. From what I have read, breaking her broody is proportionate to the amount of time she has been broody. She’s about a month in so those hormones are in pure rage at this point. I don’t expect it will be easy, but I do expect it will be interesting. And hopefully successful. UPDATE: It totally worked! One night didn’t do it. I took her out that next day and she played chicken for a while, but was back on the nest by afternoon. Four more nights in the broody breaker and when I let her out she was back to her regular chicken self. A day later she squatted for me, and then there were eggs. If you chose to make your olla with sculpture clay (white), congratulations! I hope that your olla is still performing well. 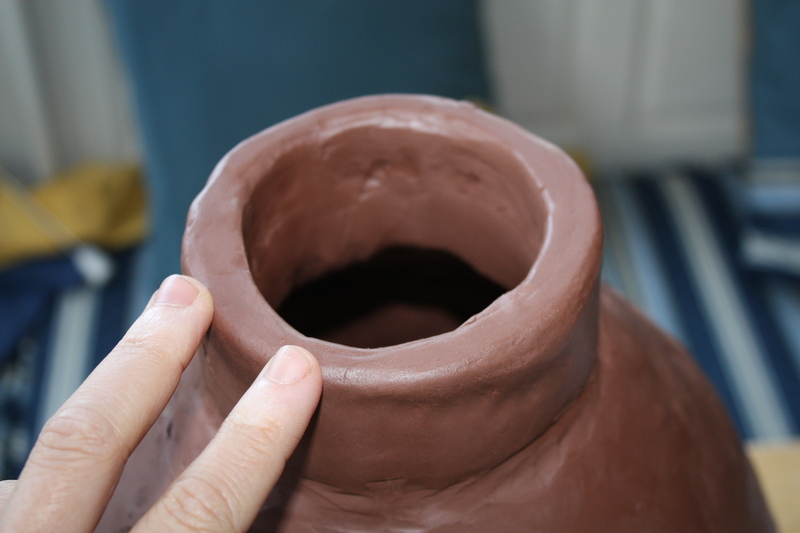 For the majority of learners who made their olla out of the more luscious red art clay – I am sorry. That clay body sucked. Whether it was fired at too high a temperature, or just contained too much fines, it don’t work worth shite. I also made two or three red ollas during the class and they lose water at a pitifully slow rate to the surrounding soil. This is not how an olla should work. Although I had previously found that some red clays worked, this one did not. Please consider trying again. I would be happy to host a hand-building event at my house, potluck-style. You could pick up the clay yourself, or I could take orders at get them all at once. Let me know if you are interested and we will set up a date. What do these words all have in common? Hold those bizarre interpretations – I’ll just tell you. They all have been used to describe a rare, tiny egg laid with little or no yolk. Instead, wind eggs contain albumin (the egg white), usually laid around a small piece of tissue. Ameraucana eggs – the ‘wind egg’ is the tiny one! Why does this happen? Amazingly, no one knows. At least, I could find no definitive scientific explanation in the professional literature or lay media. The going hypothesis is that a bit of reproductive debris heading down the oviduct gets treated like a yolk – i.e. surrounded by albumin and encased in a shell. In 6 years of hen-keeping, I have seen two wind eggs. Roughly calculating 4 hens x 6 months daily laying x 6 years, that is 4560 eggs. 2/4560 = 0.04%, so wind eggs are pretty rare. And its not just my chickens. Although rare, wind eggs have been well documented to occur at a rate of <0.1% in domesticated chickens. This statistic comes from an exhaustive analysis published in 1916 (Pearl & Curtis. Journal Agricultural Research 6:977). The other interesting statistic is that “The production of a dwarf egg is usually an isolated phenomenon occurring only once or twice during the life of a bird. Only 3.5% of the birds which produced one or more dwarf eggs produced more than two.” There was no correlation with season, age, clutch position, health, etc. The only more recent study I found was a letter published in Science in 1966 titled ‘Dwarf eggs and the timing of ovulation in the domestic fowl” by Rookledge & Heald (210:1371). They documented that the timing of wind eggs was not associated with a disruption in the timing of ovulation – i.e., wind eggs showed up as would a normal egg – roughly a day (25-27 h) after the last egg and roughly a day (25-28 h) before the next egg. Rookledge and Heald. 1966. Nature 210:1371. Alas, no one has taken up the baton as this article was in turn only cited once, on a different topic. Wind eggs remain a rare curiosity of apparently no importance or concern.